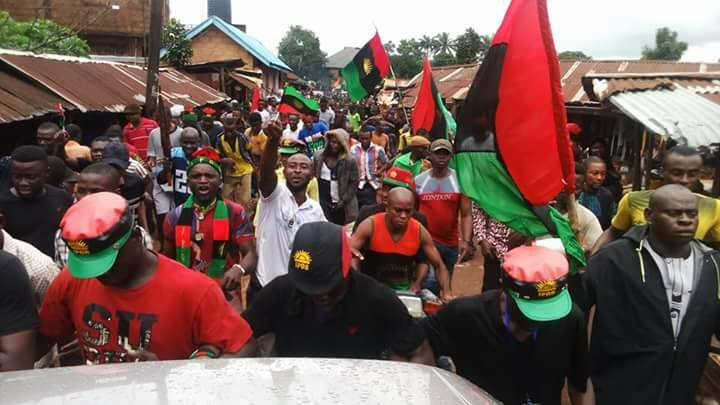 Eze Soronnadi Nwabueze Ezewuiro, Mayor of Igbo Nation in Diaspora, has declared that the Movement for the Actualisation of the Sovereign State of Biafra, MASSOB, and the Indigenous People of Biafra, IPOB, are non-Governmental Organisations, NGOs, set up to defraud Igbos. Ezewuiro maintained that people involved in promoting the groups and Biafra ideology have nothing to do with the interest of Igbos in Nigeria. Speaking with journalists in Calabar, the Cross River State capital, Ezewuiro lamented that most members of the groups are illiterate. According to Ezewuiro, “IPOB and MASSOB are NGOs set up by some individual to scam Ndigbo. They only added the ideology of Biafria to their struggle to get followership and platform to scam more people both home and abroad. “The two organizations are the private NGO of certain individuals and have absolutely nothing to do with the collective interest of the Igbos in the country. “It’s unfortunate to note that the people who are following the leaders of these organizations are illiterates who are carried away by false propaganda. “Biafra soldiers are rotting away at Oji River in Enugu State and the so called proponents of Biafra are making money from traders and then doing nothing to rehabilitate these people. “Mr. Ralph Uwazuirike set up his personal NGO and called MASSOB claiming to be crusading the interest of the so called Biafra in the South South, South East. “MASSOB was his personal NGO which he was using to skim and obtain money from our people overseas who have not come home for some time now”.